South Africa is the Southernmost country on the continent of Africa and borders the countries of Namibia, Zimbabwe, Mozambique, and Swaziland, its land also surrounds the small country of Lesotho. 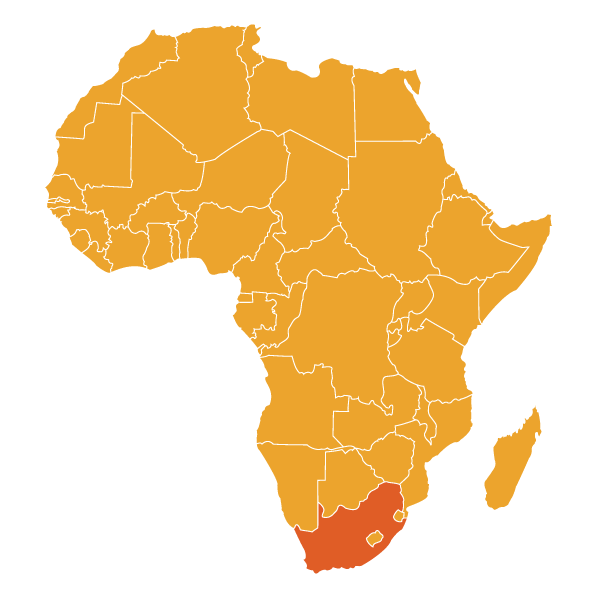 With just under 56 million inhabitants, South Africa is the largest country in Africa, it extends 1,219,912 sq. km. Uniquely, the country has three different capitals: Pretoria as the administrative capital, Bloemfontein as the judiciary capital and Cape Town as its legislative capital. South Africa is one of the most diversely populated and multicultural countries in the world, with nine officially recognized national languages, it is often referred to as the “rainbow nation” because of this incredible diversity. Of the country’s population of ethnic groups, Zulu and Xhosa groups make up 40%, although there are many more tribal cultures and spoken languages. South Africa is rich in culture and tradition, particularly in rural communities spanning across the country as song, dance and various forms of artwork are practiced and shared, passed down through generations to express stories and histories of traditional culture. South Africa has had a long and tumultuous political history and was previously under control by a white minority political group that enforced laws of racial division and isolation, this was known as “apartheid”. It wasn’t until 1994 that these prejudiced laws were thrown away, and although progression to completely move past this history has been slow moving, it is eventual. Mining is a major industry in South Africa, as the country is the world’s largest producer of gold which significantly contributes to the state of South Africa’s economy which is the strongest and most well developed in all of Africa. Geographically speaking, the country is known for its biodiversity across a variety of environments and contains over 20 beautiful national parks to be visited, with Kruger National Park being the most recognized and notable, and Cape Town’s Table Mountain coming in a close second. Ready to Travel to South Africa? Travel to South Africa would not be complete without a visit to Kruger National Park. It is one of the largest and most famous safari parks in not only Africa, but the entire world. The park stretches a 19,485-sq. km and consists of many different camps and lodges within the park, including 21 rest camps, 15 private safari lodges and 2 private lodge concessions. The number of visitors that Kruger receives continues to increase each year, since its declaration as South Africa’s first national park in 1926. Each member of the big 5 can be spotted within Kruger National Park as it is home to hundreds of animal species, including just under 150 different mammal species and 500 unique bird species, making it one of the best game viewing destinations in the world. The park is known for its exceptional biodiversity as unique and endangered vegetation exclusive to the park can be seen, a “plant nursery” even exists within Kruger to help conserve and protect their dwindling numbers. The park’s vegetation ranges from dense foliage to more barren land dotted with shrubbery, altogether there have been roughly 2,000 plant species registered in the park. Along with the natural attractions that exist within the park, relics, artefacts and ancient cave and stone engravings have been discovered that tell tales of ancient peoples who once occupied the land thousands of years ago. Addo Elephant National Park is the third largest national park in all of Africa spanning for 1,800 sq. km. The park was founded in 1931 for the initial purpose of protecting the dwindling number of eleven remaining elephants that were facing extinction in the area. The park has since grown to house hundreds of elephants, now surpassing 500. The park has expanded to include the Woody Cape Reserve as well as a marine reserve that contains two islands which are breeding grounds for penguins and other marine life. Since the Addo Elephant National Park’s expansion, it is the only park in the world to contain all members of the “big 7”: whale, great white shark, elephants, rhinoceros, giraffe, buffalo, lion and leopard. The park consists of varied vegetation with many species of plants, although many are currently endangered. The park is sectioned off into five parts: the Colchester section, Darlington Section, Kabouga Section, Zuurberg Section and Woody Cape Section with the Kabouga Section exclusively offering 4×4 trails and the Zuurberg and Woody Cape both offering hiking options. Table Mountain National Park is one of South Africa’s most beautiful and scenic areas and a UNESCO World Heritage Site. The park was established in May of 1988 as “Table Mountain National Park” as it had previously been known as “Cape Peninsula National Park”, this was an effort to protect the environment and wildlife of the area that surrounded Table Mountain itself. Over the years the park’s size has continued to grow as new areas are continually being added on and expanded upon. Table Mountain National Park is host to the central attraction that towers above the surrounding landscape and sea, Table Mountain. Visitors are able to take a cable car to the top of the mountain and enjoy the incredible aerial view of the breathtaking scenery below. The park is sectioned into three separate parts: the Silvermine-Tokai section, Table Mountain section, and Cape Point section. An abundance of floral species are found within the park and collectively there are just under 1,500 various plant types. Although larger, predatory animals no longer roam the landscapes of Table Mountain National Park, a wide variety of small animals do occupy the area including: porcupine, various lizards and birds, snakes, tortoises and frogs. A population of baboons also occupy the area, which although entertaining, have also been known to display aggression when faced with prospective free food from visitors. There are many activities within Table Mountain National Park that visitors can partake in including scuba diving, hiking, scenic drives and visits to the two other mountain peaks in the park Signal Hill and Lion’s Head Peak as well as Boulder’s beach which houses a population of 2,000 land penguins. Kgalagadi Transfrontier Park is a large park and conservation area located in both Botswana and South Africa. The park is a peace park formed from the combining of the Kalahari Gemsbok National Park, established in 1931 in South Africa and the Gemsbok National Park in Botswana, established in 1932. In May of 2002 both parks came together to collectively form Kgalagadi Transfrontier Park, a park without any inside barriers, allowing visitors to cross over the Botswana and South Africa boundaries freely within the park. The initial purpose of both conservancies before forming together was to protect and conserve the wildlife found in both parks, primarily the gemsbok for which both original parks had acquired their names. Kgalagadi Transfrontier Park in its entirely stretches a massive 38,000 sq. km with one third of the park located on South African land and two thirds being located in Botswana. The park’s landscape is very sparse aside from the camel thrown trees that dot the landscape, the terrain is barren as it is located in the Southern area of the Kalahari Desert. Although the region experiences extreme temperatures of both highs and lows, a large population of animals does exist within the park and they are well-adapted to the harsh desert climate. Animals such as cheetah, hyena, leopard, wild dog, wildebeest, springbok and of course gemsbok occupy the park, along with roughly 200 bird species. Along with game drives, visitors can also take part in hiking, 4×4 trails and swimming within the park. Augrabies Falls National Park is a national park located in the province of the Northern Cape. It was established in 1966 as an effort to protect the surrounding environment of Augrabies Falls itself. Augrabies Falls consists of thunderous rushing water supplied by the Orange River, the longest river in South Africa which stretches on for 2,200 km. The waterfall is strongest in the months of February-April as the powerful river contains most water at this time from the flooding season. Augrabies Falls National Park is known for its notably ancient granite rock and the giant aloe or “quiver trees” which scatter across its landscape. Roughly 46 mammal species and just over 100 bird species inhabit the park including springbok, zebras, giraffe and kudu amongst others, it is also known for its uniquely high population of lizards. The animals in Augrabies are very well adapted to the environmental conditions and extreme weather temperatures of both highs and lows, some have even evolved to exhibit these adaptions as physical traits, including the giraffes that occupy the park who are notably lighter than giraffes in other areas of South Africa so as to protect themselves from the intense heat of the glaring sun. The park is an ideal location for activities such as scenic walks, hiking and mountain biking as the reserve boasts stunning landscapes and multiple panoramic viewpoints. Blyde River Canyon Nature Reserve is a nature reserve protecting and conserving multiple natural wonders and the surrounding areas in the province of Mpumalanga. The reserve was established in 1965 and consists of various features including the significant Blyde River Canyon, God’s Window, The Three Rondavels and Bourke’s Luck Potholes. The environment and vegetation present amongst the landscape reflect the variations of altitude present at the specific location of their growth. The Blyde River Canyon, notably the most striking feature of the reserve and the spectacle of which it was named after is the third largest canyon in the world, and second in Africa coming after Fish River Canyon. Though the canyon is composed mainly of red sandstone, Blyde River Canyon sets itself aside from other canyons of its size as the visible growth of green vegetation appears on its terrain. Many animals can be spotted living within Blyde River Canyon Reserve, including zebra, impala, baboon and other species of primates. The Three Rondavels appear as stand-out attractions as they are uniquely shaped mountain peaks exhibiting subtle, cone-like tops. Their name is derived from traditional African homesteads, known as “rondavels” that present a likeness to the mountain shapes. The Blyde River Canyon Nature Reserve consists of multiple scenic viewpoints including Gods Window which provides a beautifully immersive and stunning view from an on-look of the 700 meter drop below and stretching landscape. Visitors can also visit Bourke’s Potholes, unique formations carved from the erosion of rock due to the flow of the Treur River. Visitors can experience views from multiple on-looks, connected by bridges. Garden Route National Park is a massive National Park consisting of land spanning from Port Elizabeth to Cape Town along the South African coast. The park stretches an incredible 1,210 sq. km and was formed by the combining of two separate national parks, Tsitsikamma National Park and Wilderness National Park in 2009. The area is known for its abundance of lush vegetation and incredibly mild climate, making it a prime tourist destination. The Tsitsikamma portion of Garden Route National Park was established in 1994 and consists of indigenous forest, waterfalls, rivers and streams. There are many activities for visitors to choose from including a suspension bridge and bungee jump, along with many hiking trails. The four main scenic hiking trails that exist within the park are: the Suspension Bridge and Lookout Trail, Waterfall Trail, the Blue Duiker Trail, and the Lourie Trail. Animals that can be spotted in this section of the park include porcupine, baboon, leopard, and other small animals and rodents. The second section that makes up Garden Route National Park is the Wilderness Section. The land that the Wilderness Section consists of has existed for many years prior and has undergone several transformations before its eventual establishment as a national park in the 1980s, it continues to evolve today. This section of the park protects many natural features including several lakes and indigenous forest. Animals that can be spotted in the Wilderness area include the honey badger, leopard, buck and velvet monkey along with marine animals such as dolphins and whales. Activities in this section of the park include hiking, kayaking, fishing and biking to name a few. Hluhluwe-Imfolozi Park, located in the province of Kwazu-Natal is known as being the oldest nature reserve in Africa, having been established in 1895. The park is 960 sq. km and due to its smaller size, an ideal setting for game viewing as it is not as large and sparse as other notable game parks such as Kruger. Hluhluwe was formed from the combining of two separate parks in 1989, Hluhluwe – an area in the North, and Umfolozi which makes up the Southern portion of the park. Hluhluwe-Imfolozi is known for its hilliness and wide range of flora and fauna, with a range of unique plant species and all big 5 existing within the park. The reserve is most famous for its population of more than 1,600 white rhinoceros due to continual conservation and protection efforts since the 1950s, as they were previously on the brink of extinction caused by poachers. Hluhluwe- Imfolozi contains 86 species of mammal including cheetah, hippopotamus, giraffe, zebra and Nile crocodile along with the big 5. The park is also known as a bird watcher’s paradise, as more than 340 unique bird species can be spotted. The Madikwe Game Reserve is a game reserve located near the Botswana border in South Africa. The reserve was named after the Madikwe River, as it is located on its river basin. The reserve was opened in 1991 and stretches a 750 sq. km. Madikwe Game Reserve is located within close distance to the Pilanesberg Game Reserve and there is an eventual plan set in place to connect the two in the coming years. The landscape of the Madikwe Game Reserve is varied and consists of expansive grasslands and wooded area along with mountainous terrain. Although the park is one of the lesser-talked about areas, it is also one of the more untouched and contains an abundance of animals including all of the major mammal species as well as over 350 unique bird species. The park is also known as a location where the endangered wild dog can be spotted roaming the land. The reserve also sets itself aside from most others as the area of the park is a malaria-free zone. Golden Gate Highlands National Park is a national park in South Africa that was first established in 1963, and has continued to expand over the years in area in efforts to protect the landscape. The park was named after the effect that the sunlight has when it hits the sandstone formations in the park, creating a beautiful golden hue of light. The park, although not abundant in large mammal species, inhabits many smaller animals including mongoose, lizards, mice and snakes. The park contains many wild flowers, each of which blooms at a specific time of year and is the reason many visitors are drawn to the park. The sandstone formations within the park protrude as cliffs on either side of the valley of the golden dam, thus also contributing to the name “Golden Gate Highlands National Park. Along with its sheer, natural beauty, the park is known for its archaeological significance as many ruins have been found within the park as well as dinosaur remains such as the oldest dinosaur embryos ever discovered that were extracted from the park. Mapungubwe National Park is a South African park located in the province of Limpopo on the boarder of both Zimbabwe and Botswana, it was established in 1995. In 2003 the park became the fifth UNESCO World Heritage Site within South Africa. Mapungubwe’s landscape is composed of forested area and unique sandstone formations as well as baobab trees that appear scattered across the park. A large number of animals can be found within the park including most major mammals such as: lion, cheetah, leopard, elephant, zebra and white rhinoceros. Along with the many animals found within the park, Mapungubwe is also an archeological site where many relics, artefacts and even ancient graves have been found, thus creating a mysterious reputation that surrounds the park. Gold, beads and other relics have been found in the area that tell the stories of the ancient people who used to occupy the area along with a burial site at the top of the mountain which has previously been excavated and re-buried. Marakele National park is a national park located in the province of Limpopo in South Africa. The park was initially established in 1994 as “Kransberg National Park”, but was renamed to Marakele soon after. In 1999 the park was expanded upon to the size that it is today, 670 sq. km. As the park is situated between two different climate types, both humid and dry temperatures, the animals that exist within the park are those that have adapted to both. Each of the big 5 game animals can be spotted within the park, along with a large population of over 250 bird species. The park is known for the Cape Vultures that inhabit it as well as various eagle species that can be spotted. The park’s landscape consists of rolling hills and larger mountains, with small forested areas and streams running through the land, along with the Matlabas river running through the park. Along with game drives through the park, bird watching, 4×4 drives and bush walks are popular activities within Marakele National Park. The Sabi Sand Game Reserve is a game reserve that is situated in the prvince of Mpumalanga in South Africa. It was first established and opened by local farmers in the area during the 1950s. The park’s name originates from the Sabie River and Sand River which run through the reserve’s land. The reserve is connected to Kruger National Park and the land crosses over, existing without boundaries so that animals can roam freely between the two. Sabi Sand Game Reserve houses hundreds of animals, included 145 different animal species and roughly 500 bird species. Sabi Sand is also noted as being one of the few game reserves that allow guests the opportunity to spot the evasive leopard with many visitors frequently reporting sightings on game drives. Along with game drives through the park, guided hikes and walks are popular activities for visitors as well. The Pilanesberg Game Reserve is one of South Africa’s largest game parks and one of the most unique. The game reserve is located inside the remains of the crater of an extinct volcano and consists of various rare rock types and geological formations. Pilanesberg Game Reserve was established in 1979 originally as a project referred to as “Operation Genesis”. The park measures 572 sq. kilometers but was expanded upon in 2004. Varied landscapes and vegetation make up Pilanesberg with rolling hills and beautiful valleys. Both the vegetation and the wildlife that inhabit the park are a combination of those that have adapted to two separate climate types of both wetter and dryer zones, thus the park has an abundance of contrasting features that now coincide. All members of the big 5 can be spotted within the park along with many other large mammals and a large population of over 300 bird species. The park is also an important historical site with many ancient remains and artifacts having been recovered from the site, dating back to the Middle Stone Age. Along with classic game drives through the park, bush walks and bird watching are also popular activities within Pilanesberg Game Reserve. Tankwa Karoo National park is a national park that was established in 1986 and is situated on the border of the Northern and Western Cape, roughly a four-hour drive from Cape Town. The park’s size is 1,436 sq. km and is famously noted for its vibrant and expensive sky, speckled with bright stars at night. The landscape for most of the year is barren and dry, a semi-desert environment that receives little rainfall. In the rare instance that Tankwa Karoo does receive water, the land sprouts up into a colourful field of blooming flowers. Many smaller mammals can be found living within Tankwa Karoo National Park including the honey badger, endangered aardvark, leopard and meerkat as well as a large population of a variety of tortoise species. The park is also a delight for bird watchers as roughly 120 species inhabit the park. There are 4×4 trails within the park available for visitors to explore as well as those for regular vehicles to enjoy game viewing and birding. Timbavati Game Reserve is a game reserve located in the province of Mpumalanga in South Africa along the border of Kruger National Park. The park was formed initially in 1956 by a collective association of land owners called the “Timbavati Association” in efforts to conserve the encompassing area and its wildlife. Over the years since its establishment, the reserve has strongly succeeded in protecting an abundance of animal species, including those that are rare and endangered. The landscape varies from sprawling and open grasslands to dense shrubbery in parts and exists within a sub-tropical climate. Some animals that can be found within the reserve include impalas, zebras, wildebeests, giraffe, and elephants to name a few. Along with the 40 different mammal species that can be spotted in the park, it is also a haven for bird lovers with roughly 360 unique bird species. The park is also known for its population of white lions, which contrary to popular belief are not albino. The white lions are believed to exhibit the evolutionary trait of loss of pigment in their fur, making them a rare sight to see. Namaqua National Park is a national park situated in the Northern Cape province, spanning 700 sq. km. The park is known for its famously vibrant and colourful fields of flowers that bloom in full, stretching fields after the rainy season in spring. For the majority of the year, the park exhibits semi-desert terrain, as the conditions of Namaqua’s environment are severe, the species of both flora and fauna are well-adapted to the specific harshness of their surroundings. A large majority of the plants inhabiting the park are exclusive to Manaqua and can only be found growing there in the flowering fields of its landscape. Species of flora found in the park include easy recognized, beautiful yellow daisies that make up the vivid yellow hues that create a striking contrast against the open blue skies. Quiver trees, or giant aloe are also found dotting the landscape of the park. Animals that can be found within the park include kudu, leopard, baboon and porcupine, as well as the world’s smallest species of tortoise, the “tent tortoise”. As there is a marine section that also makes up part of Namaqua, other aquatic animals can also be spotted including friendly seals. This charming and colourful area is an ideal location for picnic outings, leisurely walks and scenic drives. Cape Town is South Africa’s second most populated city and the legislative capital of the country. The city is known for it’s incredible beauty and natural spectacles that have gained worldwide recognition and awards. Cape Town was originally established in 1652 and is South Africa’s oldest city. It’s original function was that of a European settlement which supplied ships carrying Dutch passengers on their voyages to India, East Africa and the Far East. As time went on the city continued to expand and become more established as it’s attractive coastline drew many inhabitants to it’s the city. Cape Town is known for the vibrancy of both its physical appearance and the culture of its people, as it is one of the most diverse and multicultural cities in the world. Cape Town’s most famous attraction which draws countless visitors and tourists each year is arguably Table Mountain and its surrounding national park. The city is known for its incredible range of flora and unique plants that grown exclusively to their particular environments. Stunning beaches are a prominent feature of this city and activities such as diving, surfing and sea kayaking are popular among locals and visitors alike. Notable attractions of Cape Town include Kirstenbausch Botanical Gardens and Robbin Island where Nelson Mandela was previously imprisoned. Cape Town is known for having inhabited many of the leaders in resistance to the apartheid act that was not abolished until the year 1994. Johannesburg is South Africa’s largest city and the second largest city on the continent of Africa, belonging to the province of Gauteng with roughly 4.4 million people inhabiting it. The origin of the city comes from the discovery of gold on a farm in 1886 which has led to the steady growth in population over the years. Johannesburg is divided into six districts: the city center, Soweto, Sandton District, the Eastern suburbs, Northern suburbs and North-Western suburbs. Each section of division exhibits a notably different feel and environment, distinct in character from one another. Previously the downtown core of Johannesburg had been a bustling hub of opportunity and the financial epicenter, though an uprising of crime during the late 1980s and early 1990s caused many businesses to relocate, eventually deserting the area. In recent years efforts to ignite change and re-develop the city have been sparked by the gentrification of the Central Business Center. Johannesburg is a city known for its abundance of planted trees, with an estimated six million it is often viewed as an “urban forest”. Johannesburg contains multiple attractions and activities for visitors including Gold Reef City, an amusement park and interactive history of Johannesburg’s gold mining industry, the Apartheid Museum depicting South Africa’s history of the racial segregation system that was previously in place, and Constitution Hill, a former prison that had once housed Mahatma Ghandi.